To start closing the gaps on gender-pay inequality, first, we need to start closing the gaps between self-implicit biases associated with gender professionalism and educational capabilities silently reflected in the workplace. Gender-pay inequality is a chronic issue affecting all branches of our societies around the world. More than just numbers, gender-pay inequality is a social-cultural issue deeply rooted in professional, educational and cultural gender-bias. To start changing the gap between gender-wage inequality, we must start changing the mindset of the individuals making those salary decisions. More than 50 years ago, the United States created the Equal Pay Act of 1963. The Act has been amended multiple times and still, it has not served its main purpose. The gender-gap and pay-wage difference is still a chronic social problem, as it was hundreds of years ago, regardless of the intellectual growth and professional capacity of women. The topic is still significantly worrisome. According to the U.S. Census data, in 2016, women’s education capabilities were slightly higher than men. 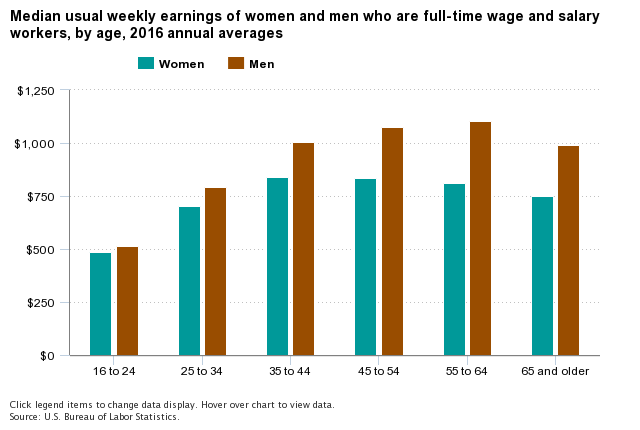 However, the pay-wage difference between genders is significantly lower for women than for men. Unfortunately, research shows it will take societies around the world approximately 217 years to close the gender-pay gaps. While this fight against gender-wage equality seems like a worthless fight for survival, it is not. Everything we do to abridge the gender pay-gap counts. For example, machines are not the ones deciding how much women and men get pay; humans are. Machines are not the ones making decisions on how much a person will get on salary; humans are. Machines are not the ones making a final decision on salary, either. After the valuation of a person’s academic and professional achievements, humans are making the decision here too. As such, it is the leader’s responsibility to focus on maintaining organizational equality between gender-pay, respecting everyone for their professional and educational achievements and accomplishments, instead of making organizational decisions based on gender and power. In our societies, millions of people are underappreciated on their performance because of gender-inequality in the workplace. Instead of focusing on the money, I suggest we focus on changing the wrongful perception and confusing mindset of those making salary decisions. Those decisions mus focus on professional achievements and not on gender. Unfortunately, gender-pay inequality goes deeper than just numbers. Gender-pay inequality is rooted in social constraints, deeply affected by the sociopolitical awareness of obsolete social norms. Leaders in charge must start by changing their mindset, as well as the organizational culture that have a negative effect of gender-pay inequality. Professional Bias: I compare professional bias as a silenced genetic disease — no one knows it is there until irreparable damage has been done. Implicit bias leads to prejudices and social profiling. Leaders should be aware of implicit personal biases before making any decision in their workplaces. Learning about self implicit biases would help leaders to understand the impact of their decisions, and it will help them to resist making decisions solely on gender. Learning about self-implicit bias helps leaders remain objective in their decisions, using academic and professional backgrounds as the foundation for decisions, instead of historical data, which could be influenced by gender-bias. It is the responsibility of each leader moving forward to start making those important changes for the sake of social-equality. Flexibility and adaptability: Societies are changing constantly. What seemed implausible 50 years ago is now a current social norm. In the 1960s, it seemed impossible that an American woman would travel into space. In fact, in the 1960s, the National Aeronautics and Space Administration (NASA) did not hire women astronauts. However, thanks to the professional capability of women, and the flexibility and adaptability of the leaders in charge, 15 years after the first man landed on the moon, the first American woman went into space. This is a tiny sample of how professional environments have the flexibility to change. Now, putting the previous example into the perspective of a gender-wage pay, to eliminate gender-based differences in our societies, leaders in charge need to be flexible and able to adapt to social changes, starting by merging all professional possibilities and eliminating professional implicit biases toward genders. Leaders must adapt to the idea that women are as capable as men of in any professional and educational environment. As such, women’s performance should be as respected and rewarded as men are in the workplace.